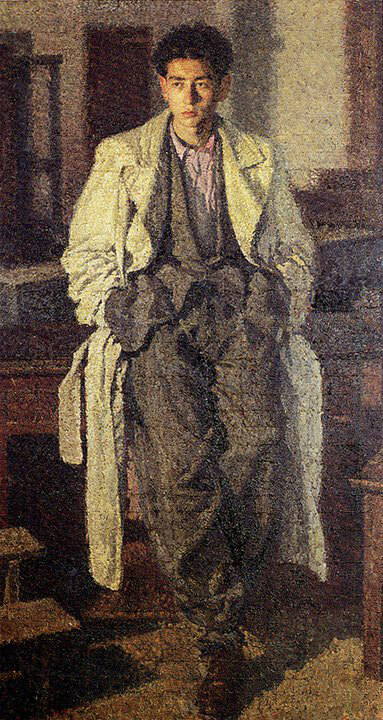 The posthumous exhibition of 1942, the first and only exhibition of Brancaleone, got convinced critical acclaim and sales. The press of the peninsula, especially the Milanese, reported his work in the different services with flattering results. It was, however, the period of the war and public opinion was distracted by more serious concerns. No wonder that for over sixty years Brancaleone remained, if not unknown, known only to a few personalities of the artistic and literary Sardinian world. Municipal Art Gallery of Cagliari, First Free Art Exhibition, MCMXLV autumn (three works). Hall of “Amici del Libro” (the Book Friends), Tribute to the Missing Artists, an exhibition organized in June 1957 by the Sardinian scholars of art Nicola Valle and Francesco Alziator (four paintings and several drawings). Somewhat higher than the presence of his works in publications and press. An article by Nicola Valle in the newspaper “L’Unione Sarda” of Cagliari in the occasion of the exhibition “Amici del libro”, 1957; an article by Vincenzo Puccio in the newspaper “La Nuova Sardegna” of Sassari, 1963; two interesting articles by the writer Adriano Vargiu, once again in the newspaper “La Nuova Sardegna” in 1973. At art criticism level, it is important the well-founded thesis for the Faculty of Letters and Philosophy of the University of Cagliari, discussed in the academic year 1993-94 by Dr. Andrea Prost. It is the same Prost, in a beautiful page titled “Brancaleone Cugusi in his brother Guglielmo memories”, published in the monograph art critic Vittorio Sgarbi, telling how he came to the decision to place Brancaleone in his thesis. With the essay on the volume Painting and Sculpture 1930-1960 (Editions Ilisso, Nuoro 1995), signed by Giuliana Altea and Marco Magnani, he finally achieved the qualified criticism. In support of the essay it was inserted the reproduction of three works of Cugusi. It is due to a lucky coincidence that the art critic Vittorio Sgarbi, in summer of 2003, leafing through the publication of Ilisso, noticed the paintings of Brancaleone in it reprinted. As he told, at first he thought to an attribution error of the works. When it was confirmed of the authorship, he became curious enough to wanting deepen his knowledge. He traced back his relatives whom in Sardinia had kept alive the artist’s memory and jealously preserved an important archive full of documents, photographs, drawings, letters, books and various items that belonged to Brancaleone. In Vittorio Sgarbi came the idea of setting up in Cagliari an exhibition. It seemed to be a desperate achievement. Too much time had passed since the period in Milan in 1942 and, as far as it was knew the exact identity of the owners of the works, it seemed almost impossible to trace them. Without even waiting for the certainty of the works procurement, Vittorio Sgarbi held in Cagliari, in autumn 2003, in occasion of the centenary of the birth of Brancaleone Cugusi, a press conference in which he announced the rediscovery and the next exhibition of the artist. In April 2004 was inaugurated an exhibition in the Municipal Art Center Exmà of Cagliari. It included 33 paintings, mostly portraits, and over seventy drawings. On occasion of the exhibition Vittorio Sgarbi introduced his monograph, which contains all the artist’s works who, from the name of his place of birth, he wanted to rename Brancaleone da Romana. Seen the great interest of the public and media, in June of the same year the exhibition was moved to the Contemporary Art Museum “Masedu” of Sassari. All eyes finally were on Brancaleone.